Some types of theft are legal in America. But there’s a catch. You can only legally steal if you work for the government. It’s a process called “civil asset forfeiture” and it enables government officials to confiscate your property even if you have not been convicted of a crime. Or even charged with a crime. I’m not joking. This isn’t a snarky reference to the tax system. Nor am I implying that bureaucrats can figuratively steal your property. We’re talking about literal theft by the state. And it can happen if some government official decides – without any legal proceeding – that the property somehow may have been involved in criminal activity. Or maybe just because you have the wrong skin color. A column in the Wall Street Journal explains this grotesque injustice. …thousands of Americans have had their assets taken without ever being charged with a crime, let alone convicted. Russ Caswell almost lost his Massachusetts motel, which had been run by his family for more than 50 years, because of 15 “drug-related incidents” there from 1994-2008, a period through which he rented out nearly 200,000 rooms. Maryland dairy farmer Randy Sowers had his entire bank account—roughly $60,000—seized by the IRS, which accused him of running afoul of reporting requirements for cash deposits. …A manager of a Christian rock band had $53,000 in cash—profits from concerts and donations intended for an orphanage in Thailand—seized in Oklahoma after being stopped for a broken taillight. All of the property in these outrageous cases was eventually returned, but only after an arduous process. These abuses happen in large part because cops are given bad incentives. Any property they steal from citizens can be used to pad the budgets of police bureaucracies. Today more than 40 states and the federal government permit law-enforcement agencies to retain anywhere from 45% to 100% of forfeiture proceeds. As a result, forfeiture has practically become an industry. And real money is involved. 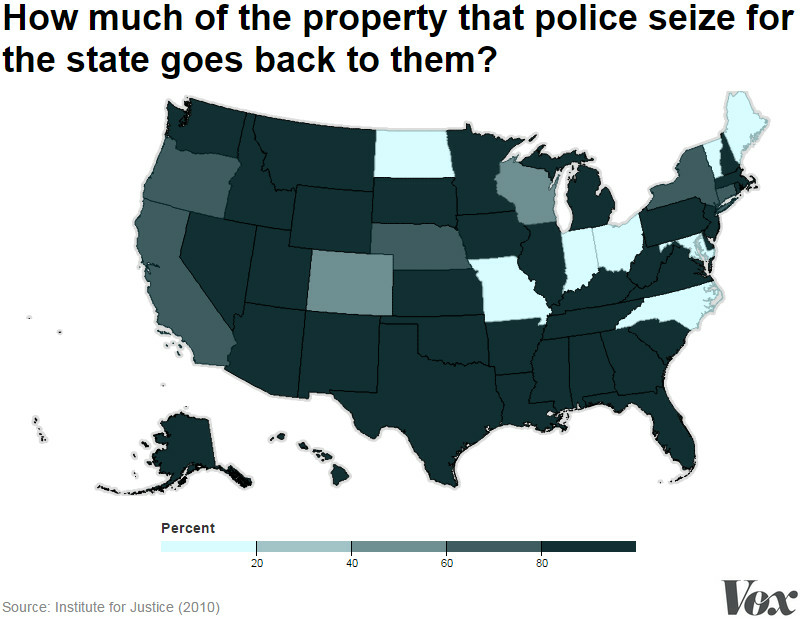 …data on asset forfeiture across 14 states, including California, Texas and New York. Between 2002 and 2013, the revenue from forfeiture more than doubled, from $107 million to $250 million. Federal confiscations have risen even faster. In 1986 the Justice Department’s Assets Forfeiture Fund collected $93.7 million. In 2014 the number was $4.5 billion. Fortunately, there is a move for reform at the state level. Since 2014 nearly 20 states and the District of Columbia have enacted laws limiting asset forfeiture or increasing transparency. Nearly 20 other states are considering similar legislation. …lawmakers in Alaska, Connecticut, North Dakota and Texas have sponsored legislation that would send confiscated proceeds directly to the general fund of the state or county. Similar measures in Arizona and Hawaii would restrict forfeiture proceeds to being used to compensate crime victims and their families. …Last fall California Gov. Jerry Brown signed a bill that, in most cases, requires a criminal conviction before any California agency can receive equitable-sharing proceeds. In January Ohio Gov. John Kasich approved legislation to ban his state’s police and prosecutors from transferring seized property to federal agencies unless its value is more than $100,000. Similar reforms have been introduced in Colorado, New Hampshire and a handful of other states. Legislative reforms are good, though judicial action would be even better. And, sooner or later, that may happen. America’s best (but not quite perfect) Supreme Court Justice is justly outraged by these examples of legalized theft. First, some background. …the U.S. Supreme Court declined to hear a case filed by a Texas woman who says that her due process rights were violated when the police seized over $200,000 in cash from her family despite the fact that no one has been convicted of any underlying crime associated with the money. Unfortunately, thanks to the state’s sweeping civil asset forfeiture laws, the authorities were permitted to take the money of this innocent woman. The Supreme Court offered no explanation today for its refusal to hear the case. But Justice Thomas is not happy that government officials are allowed to randomly steal property. Justice Clarence Thomas made it clear that he believes the current state of civil asset forfeiture law is fundamentally unconstitutional. “This system—where police can seize property with limited judicial oversight and retain it for their own use—has led to egregious and well-chronicled abuses,” Thomas declared. Furthermore, he wrote, the Supreme Court’s previous rulings on the matter are starkly at odds with the Constitution, which “presumably would require the Court to align its distinct doctrine governing civil forfeiture with its doctrines governing other forms of punitive state action and property deprivation.” Those other doctrines, Thomas noted, impose significant checks on the government, such as heightened standards of proof, various procedural protections, and the right to a trial by jury. Civil asset forfeiture proceedings, by contrast, offer no such constitutional safeguards for the rights of person or property. The article continues to explain that Thomas could be signalling that the Supreme Court will address these issues in the future, even though it didn’t choose to address the case filed by the Texas woman. Let’s hope so. It’s heartening that there’s been a bit of good news at the state level (I even wrote that reform of asset forfeiture was one of the best developments of 2015), but it would be nice if the Supreme Court ultimately decided to prohibit civil asset forfeiture altogether. But that might be years in the future, so let’s close with a very fresh example of a good state-based reform. The Wall Street Journal favorably opined yesterday about reforms that have been enacted in Mississippi. …it’s worth highlighting a civil forfeiture reform backed by the ACLU that Mississippi GOP Governor Phil Bryant signed last week with bipartisan legislative support. The editorial reminds us why asset forfeiture is wrong. …civil forfeiture laws…allow law enforcement agencies to seize property they suspect to be related to a crime without actually having to obtain a conviction or even submit charges. Police and prosecutors can auction off the property and keep the proceeds to pad their budgets. …Perverse incentives…create a huge potential for abuse. Mississippi’s reforms, which were pushed by the Institute for Justice and had nearly unanimous support in the legislature, would curb the most egregious abuses. Law enforcers would have to obtain a seizure warrant within 72 hours and prosecute within 30 days, so they couldn’t take property while trying to formulate a case. Agencies would also be required to publish a description of the seized property along with its value and petitions contesting the forfeiture to an online public database. …the public will finally be able to police misconduct by law enforcement in criminal raids. That’s something even liberals can cheer. It’s nice that there’s been reform at the state level, and the Mississippi example is quite encouraging. That’s the good news. But the bad news is that there may not be much reason to expect progress from the White House since both President Trump and his Attorney General support these arbitrary and unfair confiscations of property. Which is a shame since they both took oaths to protect Americans from the kind of horrible abuse that the Dehko family experienced. Or the mistreatment of Carole Hinders. Or the ransacking of Joseph Rivers. Or the brutalization of Thomas Williams. However, if the first two directors of the Justice Department’s asset forfeiture office can change their minds and urge repeal of these unfair laws, maybe there’s hope for Trump and Sessions. I was happy to see Justice Thomas in a recent opinion at least make reference that it may be time for SCOTUS to again review Civil Forfeiture and how its currently being used. I don’t know what case will make it to the court and allow that relook.